In this section you will find some utilities I created mostly as examples for the Delphi ASIO & VST open source project. Have a look at the source code or contribute to the project and modify all the plugins. This section features all utilities from the project. They are quite experimental and thus most probably not useful for use in an audio production. 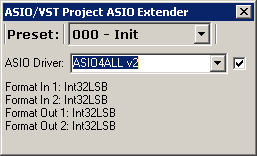 A VST plugin that sends the input to the selected ASIO soundcard while the output of the plugin is filled by the ASIO input. This plugin is shipped with the VST Plugin Anaylser and enables external hardware measurements. 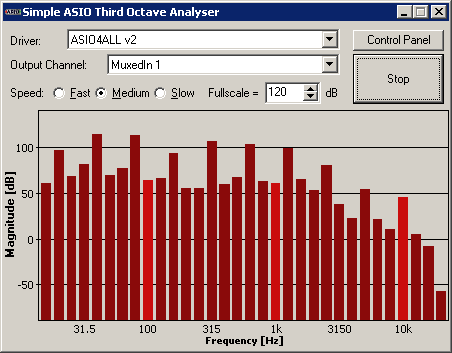 Based on the Third-Octave Analyser for ASIO, this is a VST port. It is identical except that it does not have a selection for the ASIO soundcard and channel. Instead some other parameters are available (using generic VST parameters). 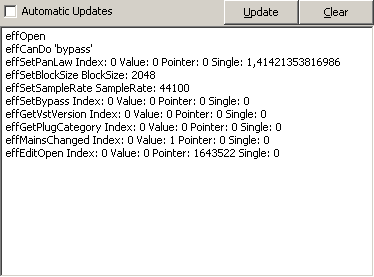 Logs all opcodes sent to this VST Plugin. Some preprocessing is taken place in order to improve navigation in the log file. The logs are automatically stored according to the date when created.